With extensive driving coverage of Southern Ontario and large customer base, makes spring start-ups and fall shut-downs easily scheduled. Arriving during a mutually acceptable window of time, every time, is always our goal. If you find you need repairs for any number of reasons, our highly qualified crews are available to fix simple and complex problems that may arise. Our office is friendly, well versed in irrigation troubleshooting as well as modern scheduling practices to ensure you can plan your day around our visits. We custom design your irrigation system based on your needs and property size for residential, commercial and recreational fields. We use high quality equipment and materials to help ensure your system will be reliable and high functioning. If your property also has a pond, we can install an aerating fountain. 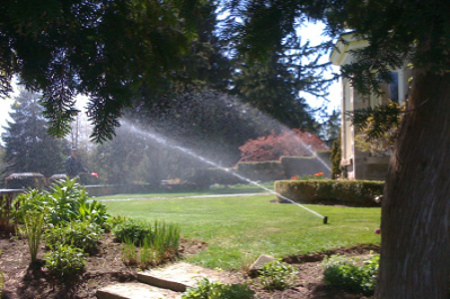 Prices for an irrigation installation vary depending on property size, materials needed and time it would take to complete. Your system can be run on city or well water, as well as on a pump system. Pump systems pull water from a pond or creek located on your property and uses that as the main water source. The Rain Man has over 29 years of experience dealing with various models and currently service over 100 customers with various submersible and centrifugal pumps.